My second love (behind hunting of course) is food. Combine the two and I’m in a state of bliss. Every year I get so darn excited about opening day that I hurry through this essential part of ensuring a healthy, energy sustaining trip. I have friends that really do it up on their hunting trips. They set up these elaborate kitchens, bring tons of food and usually have a designated cook. That’s fantastic if you have the resources. But what about the minimalist hunter who wants to pack lightly and camp in one or two spots that are away from the mainstream? I hunt with one guy, and aside from having the same hunting philosophy as me, he is also an expert in good hunting food. We want essential proteins and vitamins, ease in preparation, and food that keeps. Some, if not most, guys skip it before they set out. 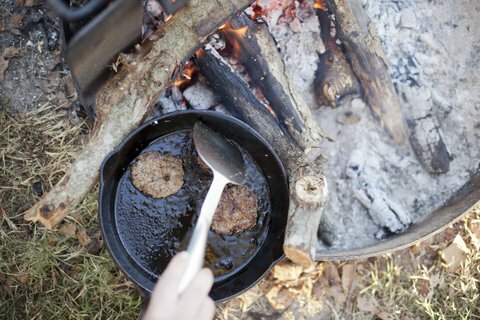 Then when they stagger back to camp at 11 am, they gorge themselves on bacon and biscuits and gravy. After that, a nap is almost unavoidable. And that’s great if that’s what you do. But if you’re like me, you realize how precious your hunt time is and want to get the most out of it — I have shot deer at 11 am. This is when a little pre-planning pays off. I make a mean breakfast burrito that can be made ahead of time (at home or during down time) and will power you through the morning. Fry up some bacon, scrambled eggs and cheese, and potatoes with onions and bell peppers. Wrap it in a tortilla and then in foil. When you wake up, you should have some coals in the fire. Throw your pre-made breakfast burrito on the coals and you’ll have breakfast before you know it. Throw a few Cliff bars and a banana in your pack and you’ll be good for the whole morning. Try it with sausage patties on a biscuit for something different. If you’re planning on coming back to camp (most guys do) before your evening hunt, lunch is the easy one. Get a good hearty bread and make a sandwich. Cold cuts and cheese keep for awhile and pack easily. Sardines, smoked oysters, cashews, and other high-protein/healthy fat foods will give you energy. Sandwiches are the best camp food there is. Don’t forget to throw on some avocado (great source of healthy fat), bell peppers or cucumber slices. Always try to eat veggies with every meal. Don’t forget to bring a jar of peanut butter and some honey! Here’s the meal we crave most and the one that always seems to be a pain. Made ahead of time, you’re not fumbling around in the dark after the evening hunt. Here’s some of my favorites made at home. Throw some pork chops, sauerkraut, and applesauce in the crock pot—sprinkle with cinnamon. Great, hearty camp meal. Pre-made pasta with meat sauce—always a filler-upper. Fry up a big bunch of kale, chard and collards in olive oil and fresh garlic. Put it in a ziplock for an easy to heat, very healthy source of vitamins. Crock pot beef stew with sweet potatoes, onion, carrots, celery and the works. Make a big batch of garlic mashed potatoes. If you want a steak, there is no better way to cook it than to place it right on top of hot coals. Brush off the ash, throw a generous slice of butter on top and you’re in heaven. Sausages like kielbasa are good fried up with a bunch of onions and red and yellow bell peppers. These are just a few examples of good, hearty and healthy camp meals that you can prepare ahead of time. They keep easily in an ice chest and can be heated up quickly, even in the dark. Don’t forget to throw a lot of butter in with everything. You need the calories and nothing tastes quite like butter in the outdoors. Last, but not least, don’t forget your favorite, well aged cast iron pan to heat up all of this wonderful stuff. Just wipe it out after each meal and you’ll be surprised at how all those flavors add to each other. Man, I’m hungry!